Every major leap forward for our species has come through adoption of innovation. From fire, language and farming to money, electricity, modern medicine and the transistor, each innovation has delivered us capabilities beyond our simple biological shell, and allowed us to increase our capability, security or longevity. Q: Why do we innovate? 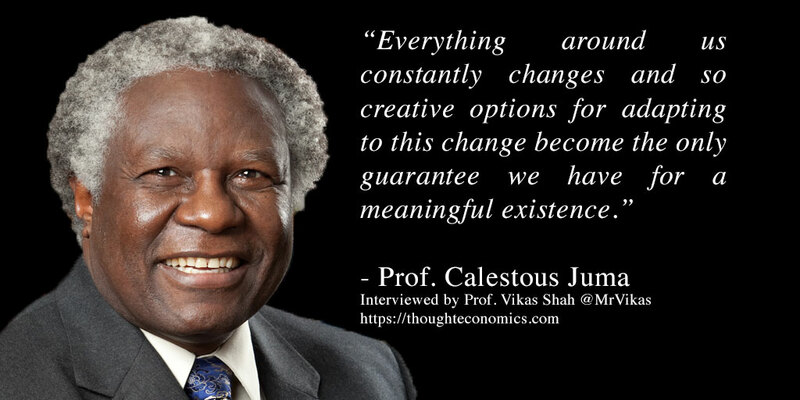 [Professor Calestous Juma] We are born creative and often seek to transform our surroundings to suit our existence. Everything around us constantly changes and so creative options for adapting to this change become the only guarantee we have for a meaningful existence. Humans are not hapless habitants of the planet. They are endowed with a sense of purpose which they express as they relate to others and the environment outside them. Q: What causes technological optimism? [Professor Calestous Juma] There is a general sense in a section of population that their creative powers can help them to overcome societal challenges. This belief is not misplaced. It goes with the very sense that we are endowed with… our creative instincts. We are also aware that technological advancement occurs exponentially as we combine existing knowledge to create new solutions. Without the feeling that new solutions could come out of our creativity we would essentially feel defeated, lose a sense of purpose and not tap into our desire to innovate. Q: Why do societies resist the influence of technological change? [Professor Calestous Juma] It is natural that a society would want to keep what they think works, the status quo. We are also acutely aware that technological changes alters society in unpredictable ways. It is the uncertainty associated with change—especially the fear of losing what we value—that leads to resistance to change. This reaction is not limited to technology but applies on all forms of socio-cultural evolution. Throughout history, society has resisted innovations including coffee, farm mechanization, margarine, recorded music, refrigeration and transgenic crops. I use these examples as illustrations because we encounter various degrees of opposition to change all the time. Today we have debates over Uber, automation, driverless cars and drones. Q: Why should societies embrace innovation? [Professor Calestous Juma] I do not agree that there is an assumption that we always should always innovate as a society. Our reality is one of widespread adoption of change but there are also many cases where we have opposed change. These debates are a result of tensions between the need to adapt to change and the desire to maintain continuity. These are societal dynamics that exist independent of our wishes. In fact, we may be supportive of change in one case and opposed to it in another case. Trying to impose ideological categories on such complex human responses to change only conceals the more important reasons underlying our reactions to change. All these factors tend to come into at varying degrees when confronted with change so it is not easy to reduce the tensions to just one single factor. In fact, opponents of technological innovation often shift their arguments depending on the nature and context of the debates. Q: How can society manage the interaction between change and continuity? [Professor Calestous Juma] For society to manage the interaction between change and continuity, the first key step is to get an understanding the roots of these concerns, which in my view are driven by the fear of loss. I would even say that people really don’t oppose new technologies but they question the way they are used so the challenges are more social than they are technological. Q: What should be the role of governments in innovation? [Professor Calestous Juma] Governments are just one constituency of actors. Given the systemic natural of technological impacts on society we need more inclusive approaches. So far, governments have tended to wait until the see the impacts of news technologies. Given the rapid change of rate, governments need to be more proactive. Q: How can education empower innovation? [Professor Calestous Juma] The fear of loss is real because it is based on perceptions of reality. It cannot be wished away by education. In fact, in many cases education may have sharpened the ability of society to detect points of loss. The idea that education can reduce resistance to innovation is often informed by the misguided view that people oppose new technologies because of ignorance. This is not the case. Q: How is innovation impacting the ‘bottom billion’? [Professor Calestous Juma] The dynamics of the impact of innovation on society are the same irrespective of scale. Society will embrace new technology if it confers benefits to its members. They will reject it if it leads to loss or creates uncertainty. In some cases, it is easier for society to adopt new technologies where they are not competing with incumbent practices. This was the case of mobile phones around the world. But technologies such as improved farming methods may run into opposition if they threaten to replace labour. This is despite their promise of higher productivity. Q: What is the role of entrepreneurship in society? [Professor Calestous Juma] Entrepreneurship is about creating new combinations that add value to society. It is not limited to business. Very often states and other public institutions perform significant entrepreneurial functions. I tend to go with scholarship that argues that there no people called entrepreneurs but people perform entrepreneurial functions at different times. Edison performed great entrepreneurial acts. But he was also fierce opponent of innovation when it threatened his business interests. Q: How can we make innovation inclusive? [Professor Calestous Juma] It is not easy to achieve equality in society so I do not talk about “equitable innovation”. But there is a basic democratic principle of engaging the wider society in sharing the risks and benefits of new technologies. It is this shared future that informs my view of inclusive innovation. The idea may go against some core values that are built around excluding others from the benefits of new technologies. That, I think, is the root course of fractured society. I should stress there that this idea is not a variant of “socialism”. I attach no ideological connotations to the concept. It just makes pragmatic sense to me that excluding people consideration of the risks of benefits of new technologies is not a good way to win their support. Q: What do you think will be the greatest areas where we will innovate over the next half century? Q: What are the key lessons history teaches us about innovation, technology and society? [Professor Calestous Juma] The key lesson I have learned from looking at 600 years of technological controversies is that human history is a footnote on the tensions between innovation and incumbency.